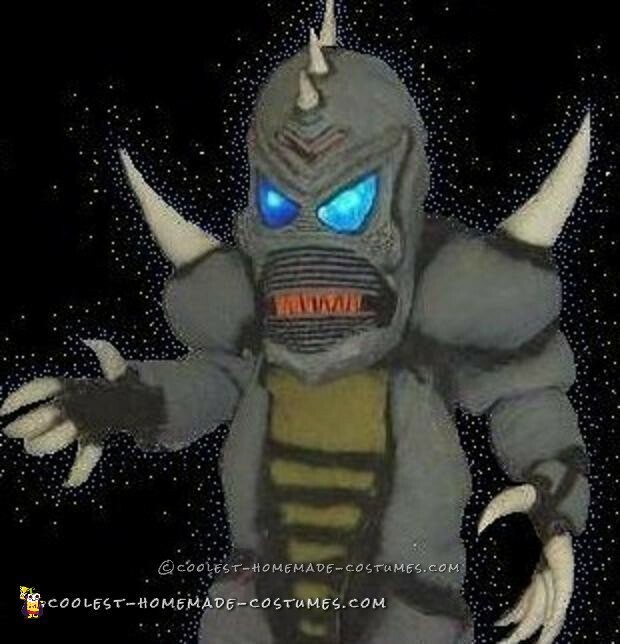 I’m not going in extreme detail about the costumes construction, if you have a question just ask! I started with making a frame out of chicken wires & metal clothes hangers. 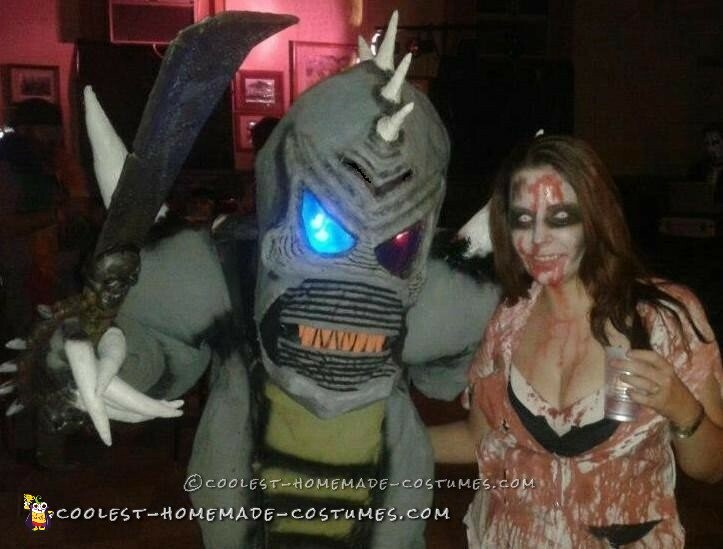 I covered the frame with numerous layers of paper mache along with cardboard & foam to mold out his facial features. This took about a month to construct. After the facial features were done I cut out two holes for the eyes (these were not to see out of). Behind each eye a small aluminum pie plates were glued on from inside the mask. They help reflect the light from the colored lights that are inserted in each eye. Two wire loops with black fabric glued to them are used to make the lips. Each wire has a high strength fishing line attached which will be used to curl the lips back so Rokzilla can “snarl”! I used a small strong electric motor with a plastic wheel attached. The fishing line is attached to the wheel. When the wheel turns it pulls and relaxes the fishing line so the lips open and close. A small spring on each “lip” help return the lips to their original position. I rigged a foam block that you push with your chin to make the mouth move. Kind of primitive but worked great! So now inside the head we have two separate wires each their with battery packs for the eyes. There’s also a motor and battery pack for the mouth. It makes the inside of the head look like a space helmet! The head is Huge! Over two feet long and kind of heavy. 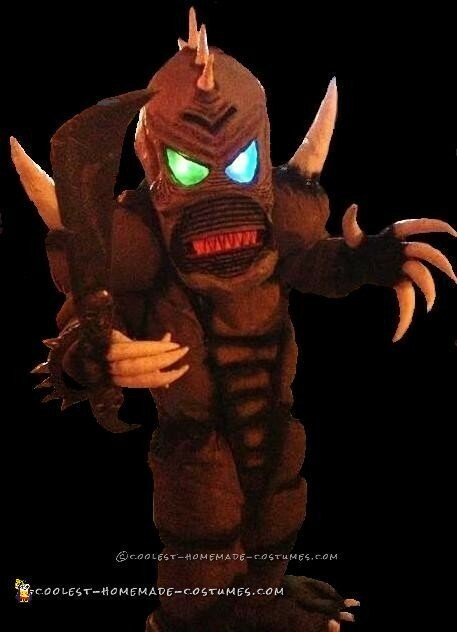 The body wasn’t nearly as much fun to construct than the head was. It required sewing lots & LOTS of sewing. UGH!!! So I took some sweat pants & a sweat shirt and sewed them together making a body suit. I then layed it out and used a black marker to sketch out where his muscles would be. I would then cut a piece of fabric (old flannel sheets) in the apx. shape of the muscle area. I would partially sew it on, stuff it with fiber fill (pillow stuffing) then sew it closed. I repeated this over the entire body. I used a similar method to construct the spines down his back. So Rokzilla is basically a giant pillow! I used cotton work gloves & foam to make the hands & old slippers for his feet. I decided on a nice “dino-grey” color. His horns, claws & spikes were painted white. I used black paint to accent the bodies features. 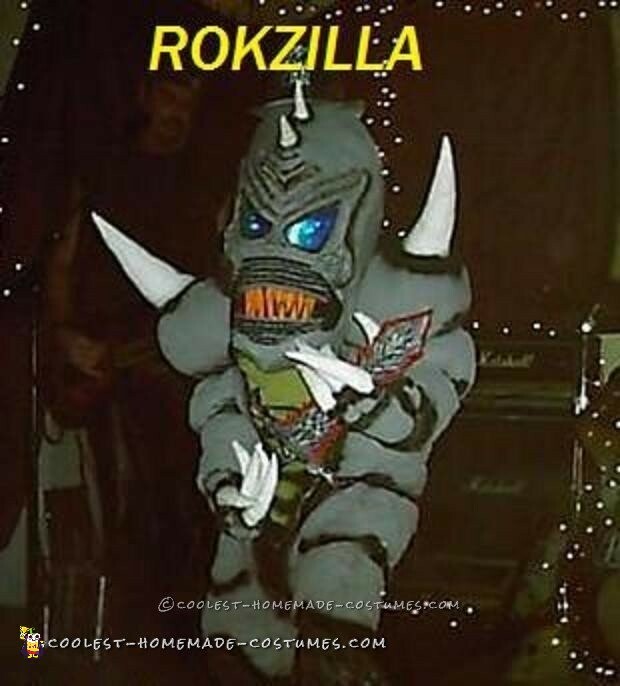 Rokzilla won 1st prize on his debut night and has won 1st place several other times. 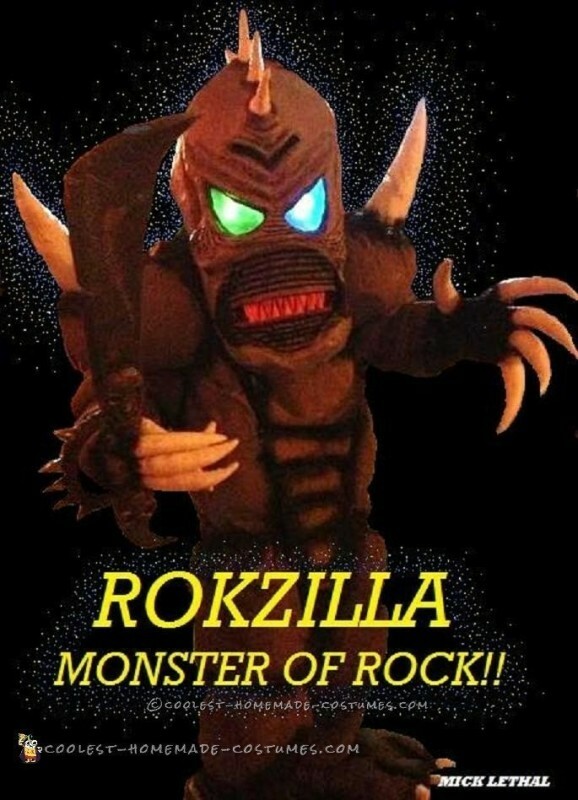 He eventually became my band’s (Rokzilla) mascot and took his name from the band!